For other uses, see Mirny (disambiguation). The Mirny Station (Russian: Мирный, literally Peaceful) is a Russian (formerly Soviet) science station located in Queen Mary Land, Antarctica, on the Antarctic coast of the Davis Sea. The station is managed by the Arctic and Antarctic Research Institute and was named after the support vessel Mirny captained by Mikhail Lazarev during the First Russian Antarctic Expedition, led by Fabian Gottlieb von Bellingshausen on Vostok. 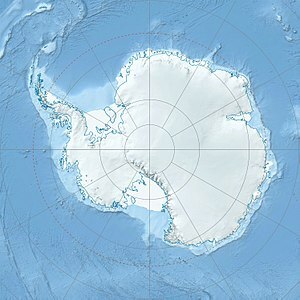 The station was opened on February 13, 1956 by the 1st Soviet Antarctic Expedition. It was originally used as main base for the Vostok Station located 1,400 kilometres (870 mi) from the coast, this function is now served by Progress Station. In summer, it hosts up to 169-200 people in 30 buildings, in winter about 40-50 scientists and technicians. The average temperature at the location is −11 °C (12 °F), and on more than 200 days per year the wind is stronger than 15 metres per second (49 ft/s), with occasional cyclones. Main areas of research are glaciology, seismology, meteorology, observation of polar lights, cosmic radiation, and marine biology. Some 2 kilometres (1.2 mi) south of the station stands a metal stele with an inscribed plaque. It was erected on a sledge on the land transport route between coastal Mirny and inland Vostok Station. It commemorates Anatoly Shcheglov, a driver-mechanic who died while performing his duties. It has been designated a Historic Site or Monument (HSM 8) following a proposal by Russia to the Antarctic Treaty Consultative Meeting. Other similarly designated historic sites in the vicinity of Mirny are Ivan Khmara's Stone (HSM 7) and the Buromskiy Island Cemetery (HSM 9), both on Buromskiy Island 2.7 kilometres (1.7 mi) north of the station. Climate graph of 1956-2012 air average temperatures at Mirny Sta. Mirny Station has an ice cap climate, since all months are below 0 °C (32 °F). Although, it is heavily influenced by the glacial nature of Antarctica's interior, it retains a strong maritime influence, resulting in high annual snowfall. Summers however, are sunny and dry, reflecting a mediterranean precipitation pattern, in spite of its poleward latitude and cold temperatures. Summer see highs approaching 2 °C (36 °F) on average, whereas winters are stable just below −15 °C (5 °F) means for several months. ^ "List of Historic Sites and Monuments approved by the ATCM (2012)" (PDF). Antarctic Treaty Secretariat. 2012. Retrieved October 25, 2013. ^ "Mirny observatory (89592)". Arctic and Antarctic Research Institute. Retrieved November 2, 2015. This Queen Mary Land location article is a stub. You can help Wikipedia by expanding it. This page was last edited on 17 April 2019, at 02:50 (UTC).